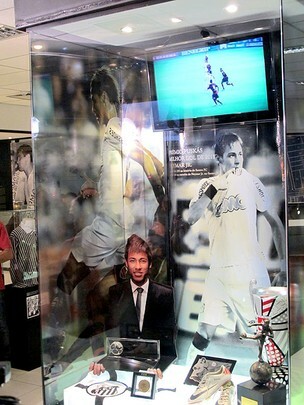 Neymar may only be 19-years old, but Santos have confirmed his legendary status with a tribute in their club museum. 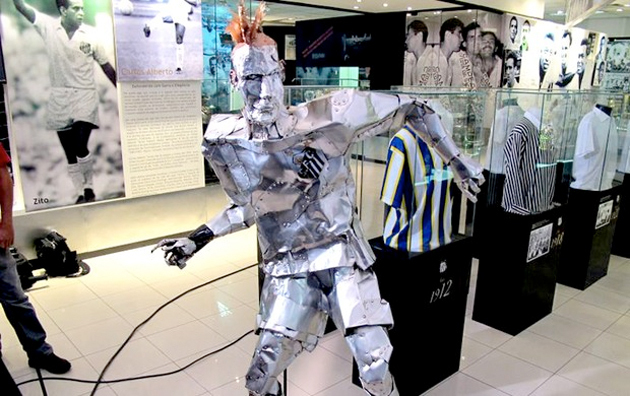 The young striker has been immortalized with a display commemorating his rather excellent goal against Flamengo, which won the FIFA Puskás Award as the most "beautiful goal" of 2011. Also added to the museum was a bizarre metal statue, complete with flaming robotic orange Mohawk and incredibly sinister scowling eyes. Dirty Tackle cannot confirm who created the tin man tribute or why it looks the way it does, but we're going to assume it's made from cat food cans and that it also smells of cat food. We wouldn't want to suggest that Santos has rushed out some Neymar memorabilia before he makes his inevitable move to a European club, but, well... actually that's exactly what we want to suggest.